D&G is pleased to offer this superb focuser, manufactured by Astro-Physics, Inc. All D&G tube assemblies are now equipped with this fine unit. The drawtube is a big 2.7” I.D., complete with aluminum adapters for 2” and 1 ¼” accessories. The 1 ¼” adapter is threaded for 48mm filters. 2” and 1 ¼” eyepieces and accessories are held firmly by a brass locking ring. Features black anodized, threaded aluminum base, smooth helical rack and pinion adjustment, and focusing lock. Drawtube is fully baffles for maximum contrast. Weight is 5.25 pounds. Threads directly into our focuser backplates listed below. Shipped postpaid in continental US. The above focuser threads directly into these machined aluminum backplates. Designed to fit our aluminum tubing. Shipped postpaid in continental US. 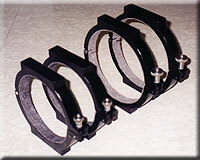 Aluminum mounting rings by Parallax Instruments firmly hold our tube assemblies in place. Rings are hinged for easy opening and closing and felt lined. Requires two holes per ring in your mounting plate for attachment. The ¼-20 threaded base holes are spaced 3 1/2" center to center apart. Sold in pairs. Shipping charge $10.00 in US, at cost elsewhere. Massive triple thick rings for our 10" and 11" OTA's now available! Priced at $395.00 (two rings) plus $10.00 shipping. Base holes drilled to your specs.